Early Start German 1: Hallo! Wie geht's? If you first have to persuade your colleagues and the school authorities that it's a good idea to teach German to your class, our page Why PMFL? sets out some reasons that you and they may find persuasive. CILT (Centre for Information about Language Teaching) has recently produced some videos which give an excellent presentation of the sort of work and standards of results that are possible. CILT - information, resources, conferences, courses, publications - http://www.cilt.org.uk/. The Goethe Institute has linformation that will help you make a case for choosing to teach German as your language. If you did study German, but need to improve, most areas offer a local adult education course which may prove useful. - by CILT and its associated network of Regional ELL Support Groups at "Comenius Centres" around the country. CILT - information, resources, conferences, courses, publications, includes how to contact your local "Comenius Centre". Michel Thomas has an interesting approach to language learning that appears to have had successes with some adults who failed to learn with other methods. You might find it worth examining as a possible way of brushing up your own language. He claims to provide "in a few hours a functional working knowledge of a language without books, note-taking or conscious memorizing." - but we have no personal experience on which to judge. The CD provides an eight-hour course to get your German up to speed - other languages also available. The Framework document sets out an approach to content and methodology for language teaching in primary schools in England. It isavailable to download from the DfES Standards website at: http://www.standards.dfes.gov.uk/primary/languages/. Part 3 - More detailed planning and guidance will be published in Spring 2007. Visit the Curriculum for Excellence website for more information. The non-compulsory schemes have been designed to support those primary, middle and special schools that are currently teaching, or planning to teach, a modern foreign language at key stage 2. The scheme provides a flexible framework designed to help schools to develop or adapt their own schemes for a 4-year course. It comprises an overview and 24 units for German (and other languages), comprising 4 years' work. Non-specialist class teachers may find some of the suggested work too demanding, but the Scheme of Work does offer a useful benchmark against which to compare what you decide to do - and it does contain some interesting lesson ideas! 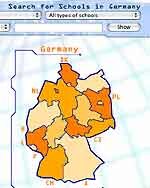 The Voyage Kids: British-German Connection - a website to help primary school children to find out a little more about each other's countries and each other. It provides opportunities for showcasing links, contacts and joint projects between primary pupils in the UK and Germany. Virtual visits by video-conferencing ? More schools are enjoying video-conferencing links - it is easier for young beginners to communicate - despite their small vocabulary - with a combination of moving image and spoken as well as written language. For ideas about using video-conferencing within a joint project with a partner school, or to bring a foreign expert or place of interest into your classroom, contact the Video-conferencing in the Classroom Project. They give technical and educational advice, run training, help find partners and can even lend you equipment. ... or an actual visit overseas? It will help motivate many children to learn German if they know that, later on in the school year, they will be meeting with the children from their partner school. For most primary schools, travel distance means a residential stay for a night or two is the most practical way of visiting Germany, Austria or Switzerland. http://www.teachernet.gov.uk/visits - useful info. on UK Government Health & Safety requirements for educational visits, including Guide for Organisers (downloadable). - essential reading to help you avoid the perils of an ill-prepared trip abroad with children. Many school organise visits abroad - careful planning minimises risk and increases the value of the trip. There is also the possibility of bringing German-speaking people into your classroom from amongst visitors to the local community, and people who live or work locally who are native speakers. If there are German, Austrian or German-Swiss companies in your area, they may be willing to help. It is also worth exploring the idea of having a "language assistant" for a few hours a week - probably shared with other schools, because there is a cost. Foreign Language Assistants' (FLAs) are foreign graduates training to teach English in their own country. 'The Foreign Language Assistants scheme' is described on the Department for Education and Skills website: http://www.dfes.gov.uk/a-z/.html and look for "FLA" (Foreign Language Assistants). It's good to meet with colleagues who are tackling similar tasks to swap ideas and discuss how to do things better. (Type your own personal names instead of firstname and lastname). * CILT - the National Centre for Languages - information, resources, conferences, courses, publications. On the Primary Languages website you can now find an electronic version of the European Language Portfolio which can be used as a photocopiable record of achievement for Primary pupils learning languages plus a teacher's guide to using the Portfolio. We recommend this as a potentially very useful record of achievement to pass on to the pupils' next teacher; if properly used, it's a valuable aid to ease transition to secondary school. You are free to download these documents and use them with your own pupils.